As soon as we set foot on California’s High Sierra Trail, the clamour of the world fell away, replaced by the rhythm of our footsteps, the chatter of forest birds and a feeling of stillness. A week of wonder lay ahead. It was euphoria of the purest kind. We would follow the metre-wide path from the beauty spot of Crescent Meadow in Sequoia national park to the other side of the Sierra Nevada, land of the gold rush, the glacier-sculpted granite dome and the giant tree – a place “father of the national parks” John Muir described as “the most divinely beautiful of all the mountain chains”. It had been pulling on my imagination for a long time. 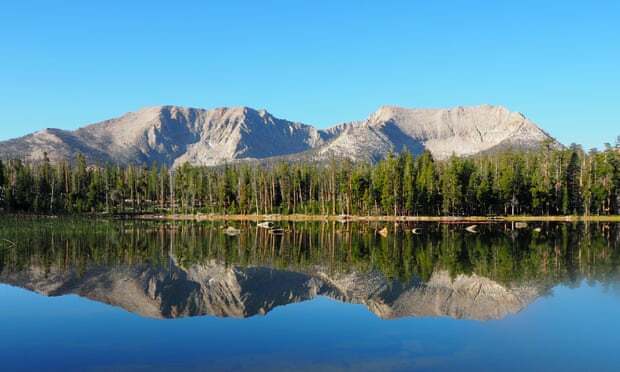 The trail starts near what is claimed to be the world’s biggest tree, General Sherman, two hours’ drive east of Fresno, and ends at Mount Whitney, the highest mountain in the contiguous United States. It can be seen as a counterpart to the more famous John Muir Trail but that demands an annual leave-hungry three weeks or more. The High Sierra Trail is no less impressive but takes six to 10 days. I persuaded two friends, Jamie and Chris, to join me, and after months of planning, days of travel and hours of painstaking packing, we were finally here. At first we were walking in the shadow of neck-craning lodgepole pines and giant sequoias but the trail quickly opened out to reveal the serrated peaks of the Great Western Divide in the distance. Chipmunks hastily abandoned their half-eaten pinecones as we approached. The occasional bird call and the white noise of waterfalls only accentuated the silence. We spent that night among the tall pines of Bearpaw Meadows, the first of a series of minimal, virtually invisible campsites we would use. The next morning I was using a standpipe close to our tents when I heard a loud rustling. I looked up, toothbrush in mouth, to see a black bear and her two cubs nosing through some long grass. There’s a healthy population of black bears in the Sierra Nevada and they only become aggressive if accustomed to human food, but for a Yorkshireman accustomed to nothing more threatening than an otter, it was quite a sight. The next day’s walking was quite short (5 miles), which gave us hours to spend on the shores of the largest of the Hamilton Lakes, a slice of heaven on earth overlooked by a towering granite formation known as Angel Wings. After pitching our tents, we swam out into the blue-green heart of the lake amid a beautifully sculpted amphitheatre of mountains. As the afternoon turned into evening, the pale peaks and domes soaked up the colours of the setting sun: vivid yellow, fiery orange and, finally, a lingering band of ember-red alpenglow. Among the handful of other people camping nearby was seventysomething Bob from Arizona, who recounted meeting a saucer-eyed European that morning. “He’d just seen some bears, but he looked like he’d seen a ghost,” he chuckled. I realised I had spoken to him briefly when he put his head out of his tent. “That was me,” I said. Although the Sierra Trail runs through high, wild country – hence these close encounters with wildlife – it is also a feat of human engineering. Started in 1928, it was the first Sierra trail designed solely for recreation, and its builders tackled sheer cliff faces, high mountain passes and avalanche chutes to construct a trail that racks up around 4,200 metres of elevation gain over its 72-mile length. In other words, it’s challenging. The next morning we got up early to beat the heat for the long climb over the Great Western Divide through Kaweah Gap. Under the ice-striped north wall of Eagle Scout Peak, we stopped for a swim in the turquoise (and electrifyingly cold) waters of Precipice Lake, then descended into the expansive Big Arroyo valley, the sort of place you expect to see an eyepatch-wearing John Wayne riding out from the trees. We pushed on, perhaps unwisely, through the heat of the afternoon to Moraine Lake, arriving to see sunset-coloured mountains mirrored perfectly in the flawless surface of the water. It was a hard day, and blisters, heat and heavy packs were taking their toll on morale, but the uplifting peace and beauty encapsulated what I had been drawn to in this landscape. The next day, in oven-like temperatures, the hot springs of Kern Canyon were novel but redundant. We stopped instead at every mercifully cold stream. Even in late summer, in a year when drought and wildfires blighted California, water never seemed to be lacking. We camped that night amid the pine groves of Junction Meadow and got up early for another long climb, unshouldering our packs on the shores of Guitar Lake (our home for the night) at 3,500 metres, around midday. With tomorrow’s challenge, Mount Whitney, looming another 900 metres above us, we whiled away the afternoon chatting with fellow hikers, shielding our food from fearless marmots and being reprimanded by a dry-humoured ranger – also called Bob – for camping too close to the lake. Squalls of rain blew through in the night but we crawled out of our tents at 3am to clear skies. The sky was so densely crowded with stars we could not recognise constellations, just the bridge of light that was the Milky Way vaulting above the jagged black outlines of the mountains. I felt a sublime shiver. Several hours of headtorch-lit switchback climbing later, I stood on the summit of Mount Whitney, not long after the first rays of sunlight had struck it. I looked east, down into the arid Owens valley, where there were towns and roads, signs of the civilisation we had seen and heard nothing of for almost a week. I knew that by the end of the day, after the spectacular but exhausting descent to Whitney Portal, there would be mobile signal, cheeseburgers, beer, showers and sleep. But then I looked west, where the High Sierra was spread out like a map, and picked out the remarkable route we had walked. I was sad it was coming to an end: it had been one of those experiences which brings life to life.